I have followed a very simple method to make the cake as well as frosting/ Icing too. You can used Whipped cream frosting, Butter cream frosting or Fondant works to decorate the doll. Here i have used a single petal nozzle to decorate the whole cake. You can decorate with the colours and patterns of dress for the dress as you or your kids wish. I have used Pink colour and Strawberry flavour to match the colour. Also the flavour is the most liked by Kids. Take three 18 or 20 cm pan and line with baking parchment or grease the pan with butter. Dust with flour to cover all over the pan by shaking the pan. Tap out the excess flour by inverting and tapping the pan. Beat the oil/butter well (in a bowl) then add the sugar and eggs mix well using a electric mixer until creamily mixed together. Whisk well till frothy stage. Add the milk, salt, food colour, strawberry essence and beat well. Then add the flour half cup at a time and fold well till combined. Scrap the mixture into the prepared cake tins and smooth the surface with a spatula. Bake until a skewer inserted comes out clean.Cool the cake and cut the cake if your cakes top are not level, to get a leveled top. Whip the whipping cream well in between adding the icing sugar. At last add food color and strawberry essence and keep inside fridge till you use. Take a hard board and draw 20 cm diameter line, cut the board and cover with aluminium foil and cut the foil to approximately to 22cm diameter. Fold the excess 2cm on the opposite side and stick with a tape. Keep a teaspoon of icing on the board and keep the first cake. Apply 2 -3 tablespoon full icing and spread evenly over the cake leaving 1cm border. Keep the second cake slightly press with hand to stick the cakes together. Apply icing on ton top of second cake and keep third cake on top of that. Using a serrated knife carve the cake to a dome shape. 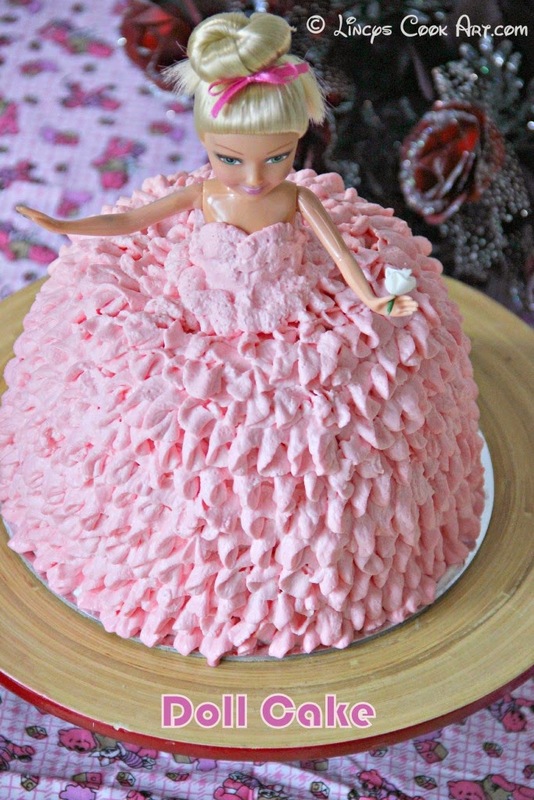 Remove the legs of the doll (if it is so long) and Insert the doll on top of the cake. Using a pastry brush remove the crumbs sticking to the cake. Insert the rose making nozzle and fill the icing on the piping bag. Hold the piping bag 900 angle and keep the icing on circular motion to form the frills on the dolls frock. Insert the doll on top and finish the dolls full dress by same nozzle or different nozzle of your choice. Note: I have used single nozzle to decorate this doll. It looks awesome.. I love your all baking dish.. Perfection..
wow ! wat a post.. wat a beauty..
Congratulations on your 200th post! Cake looks perfect! A doll cake is next on my list of cakes to make! Congratulations on your 200th post lincy ,cake looks awesome & perfectly done . Congrats for your 200th post. This cake is a perfect treat to celebrate this occasion and it looks very professional lincy. Congrats on your 200th post, the cake looks awesome, beautifully done. 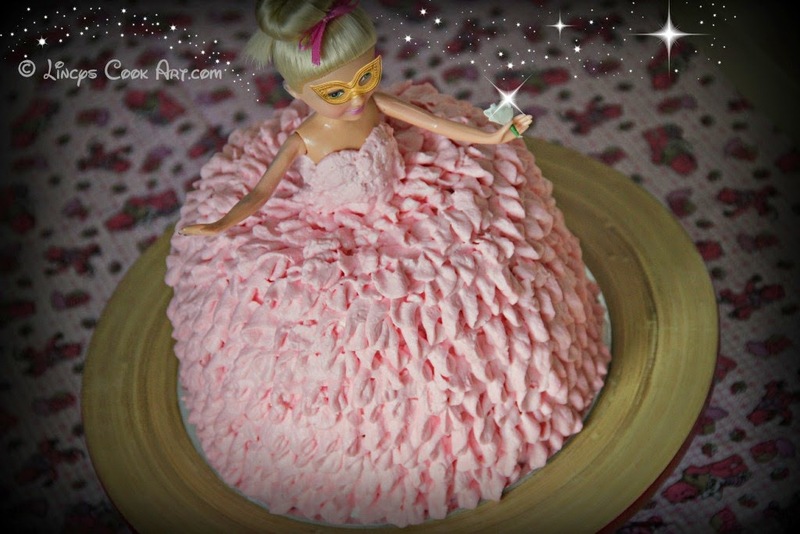 Barbie cake looks very stunning.........Congrats on your 200th post!! Congrats on ur 200th post..Wat a beautiful cake, wish i get this whipped cream frosting as much perfect as you. Looking great. Thanks for sharing recipe in simple words. Make Doll cake for doll lovers on their birthday celebration and give them surprise. Great post!! I love your doll cake recipe and Thank you very much, I have found this info extremely good!